You want unlimited game play, discounted food & drinks, and some space just for college students? You got it! A $15 cover gets you all that and more every Wednesday during College Night. Students 18+ welcome; Student ID required. Must be 21+ to order alcohol. College Night is currently not available in Las Vegas. College Night is walk-in only. Reservations are not applicable for the College Night discount. *7-10pm at Topgolf Wood Dale. Food and drink specials vary by location. Drink specials not available in AL, GA, IL, IN, NC, OH, OK, SC, UT, TN, and VA. Limited bays available. A separate bay for each group not guaranteed. 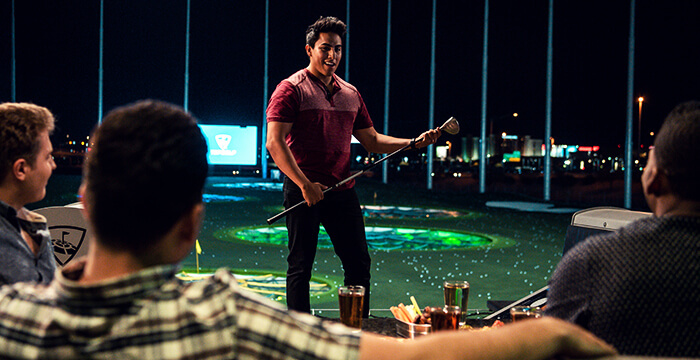 Whether you’re an aspiring golf pro or picking up a club for the first time, Topgolf is everyone’s game. It’s fun. It’s competitive. And it’s a unique way to have fun with your friends or family.